Making a live video is easy. As long as you have a smartphone and a Facebook account, you can make and publish your own video. However, making a video that people will watch and share, well that is another story. How do you engage with your viewers? How do you keep things interesting? How do you promote your brand? Buzzfeed’s content just goes to show why they continue to dominate the online world. 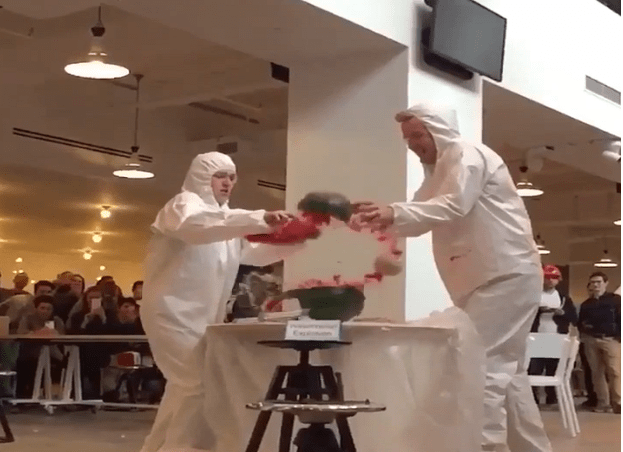 Their most popular live video to date is about a watermelon explosion. In the video, two people placed 686 rubber bands on a watermelon, while 800,000 people tuned in live. It was such a hit that watermelon memes and the #watermelon trended in the United States. As of September 2016 the video has 10.9 million views, making it one of the most viewed live video of all time. Be unique: Brainstorm video ideas that have never been done before, or that your brand could do better. Show your audience how you are doing the activity. This way, you can make them feel like they are a part of the experience. 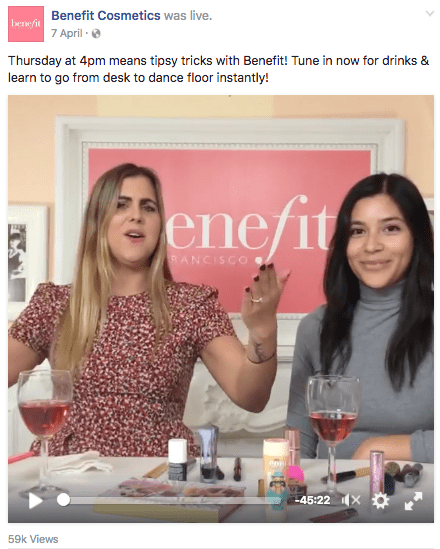 When it comes to live beauty vlogs, Benefit is definitely ahead of the game. Their series called “Tipsy Tricks” which airs every Thursday has thousands of viewers. This is probably because they keep their audiences involved every step of the way. For example, the hosts regularly ask their audiences to choose which beauty product they would like them to try. 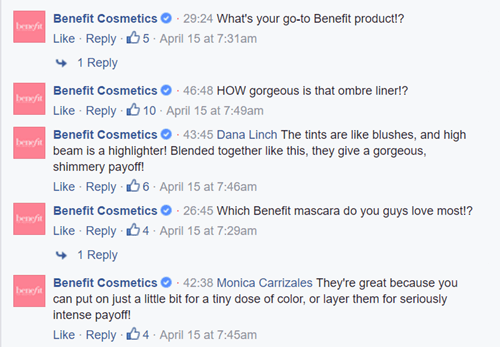 While applying the product the hosts casually chat with the audience, and at the same time, they show how the makeup product would look like once used. Viewers can even submit their own video ideas through Snapchat or the Facebook comments thread. Every episode is definitely engaging. Plus, the brand makes a lot of effort to get to know their viewers. Here, is a comments’ thread that illustrates how they interact with their viewers. As you can see, the brand makes a lot of effort to reply to every question in the comments thread. In addition, they keep things interesting by encouraging their viewers to share what they think. Engage: Be sure to reply to the comments of your viewers, especially if these are questions. Ask: Encouraging viewers to respond to a question or to make suggestions, significantly increases your level of engagement. When making Facebook live videos, communicate as if you are talking to a friend. This way, your viewers can feel a more personal connection with your brand. Do you think tiny objects are cute? Well, when it comes to all things tiny, nothing can beat Tastemade’s Tiny Kitchen. 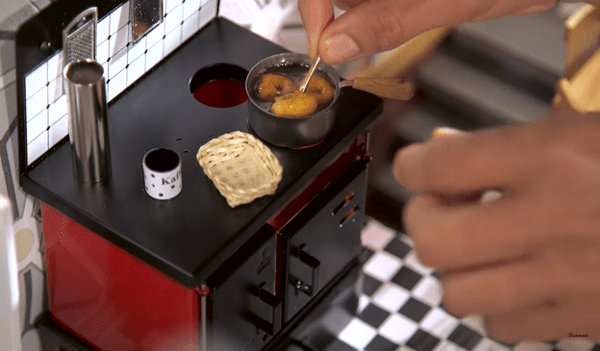 The series featured light-hearted videos that shows viewers how to cook with miniature kitchen equipment. While it was relatively simple, it was interesting enough to keep viewers tuned in. After all, who is not interested in an attempt to cook with equipment that is the size of your hand? Think outside the box: There are tons of video ideas that could propel your brand to success. All you need to do is to stay creative. Find a common activity and find a way to make it seem unconventional. When it comes to Valentine’s Day, it can be pretty difficult to stand out. That’s probably because all brands hope that they will create the hit marketing campaign that will propel them to social media stardom. After all, when done right, a live video with an element of love or romance has the potential to go viral. 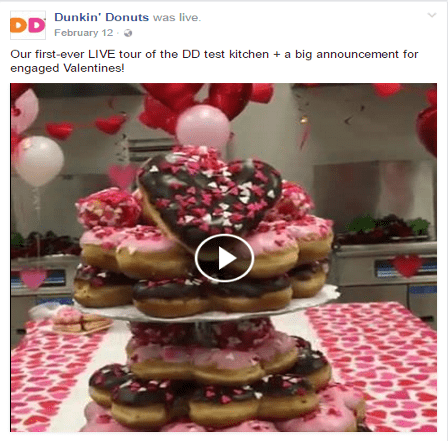 One great example is Dunkin Donuts Valentine’s Day video, where the brand gave its viewers a behind-the-scenes look on how their culinary team created a cake made of heart-shaped doughnuts. The cooking event was followed by the announcement of their February Dunkin’ Hearts Love contest. Engaged couples who shared their proposal stories had a chance to win $10,000! With a unique and creative marketing campaign, it is no surprise that the brand conquered social media. The video session had 21,000 videos, which considerably topped their previous pre-recorded videos. This just goes to show that a bit of spontaneity can go a long way. If you are running out of ideas, then try to show behind-the-scenes videos of your brand. Encourage your audiences to share their stories online, but remind them to include your hashtag. This way, you can benefit from user generated content. Let’s say, you are having trouble with coming up with interesting content. You want to make hit videos like Buzzfeed. You want to make vlogs that people will watch. But you do not know how to get started. A classic way to stay relevant is to create how-to’s and tutorial videos, because everyone wants to try creating something for themselves. 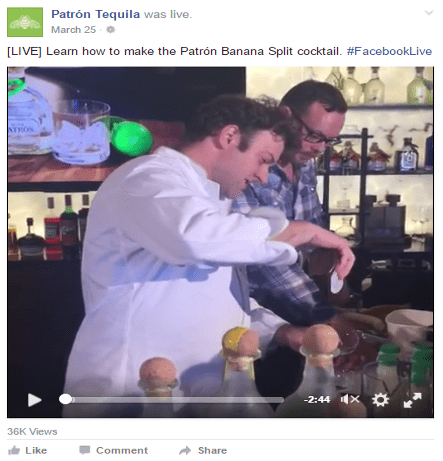 Just check out Patron Tequila’s Live video on how to make Patrón Banana Split cocktail. It’s simple and easy, while their cocktails are always irresistible. The video currently has 36,000 views, which is pretty amazing for a live video tutorial. Create actionable how-to videos, that your viewers can do on their own. Create videos that are relevant to your brand’s niche. This way you can increase your brand’s relevance in your industry. As you’ve learned from the list, there’s a lot of ways to stand out in Facebook live. All you have to do is to know your brand and to be creative. Think about a unique activity that you would like to show your viewers. Shoot the video as if you’re talking to a friend. This way, you can make your viewers feel like they are a part of the experience. 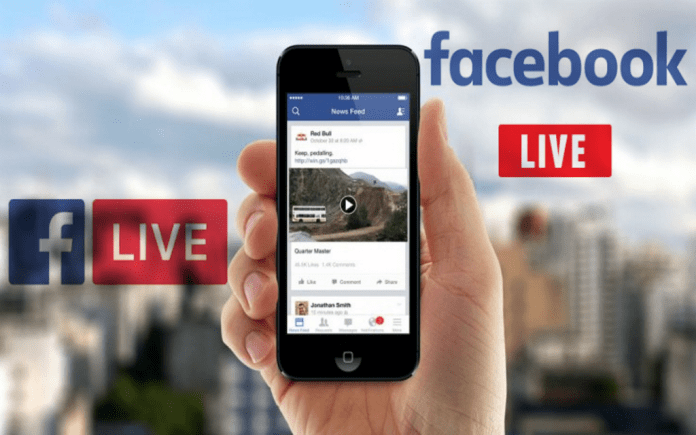 Do you have any more examples of Facebook Live video campaigns? Be sure to comment them down below!